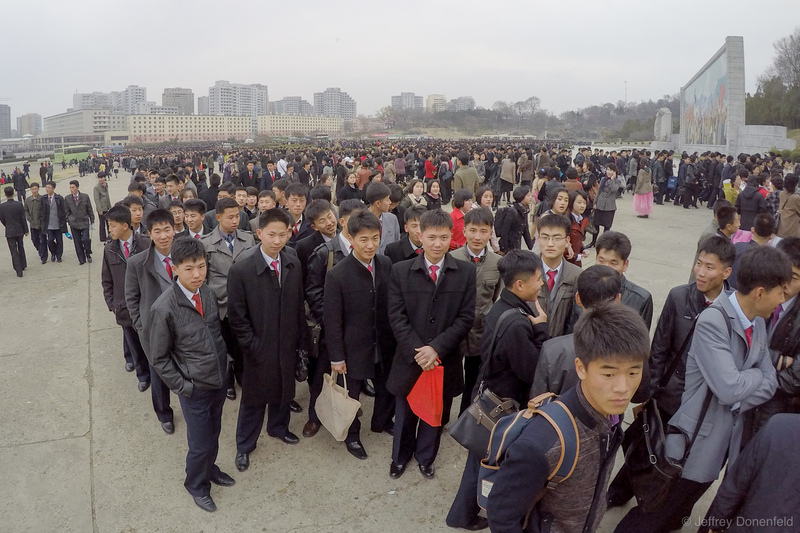 The Pyongyang Marathon was held on a Sunday, and lots of locals showed up for the big event. I'm not sure how people are selected to go to the events, but the overall vibe of the crowd entering the stadium wasn't as enthusiastic as I'd expect going into a major sporting event. There was both the marathon as well as a soccer game on the agenda, and I would have expected these spectators to be a bit more jubilant about going - for free! Perhaps it was because it was somewhat early in the morning, or perhaps because they're being forced to attend - I simply don't know. In addition to this photo, I captured a bit of video of these guys, who got energetic as soon as I approached and shook their hands. It felt like we were all grateful for some sort of connection to the other side.